TS Packaging, division of the Robino & Galandrino Group, has 50 years experience in flexible packaging. It becomes part of the Group in 2009. The company specialises in the construction of innovative packaging machines for all industrial sectors, food and non-food, starting from film rolls or using pre-formed pouches. The major strategic sectors of this company include: food, beverage, cosmetics, pharmaceutical, chemical, medical, horticultural, and pet food. TS Packaging works in order to meet the needs of their customers with complete packaging solutions with flexible materials. Thanks to ongoing research, the company can develop practical and functional solutions, meeting the most different needs. 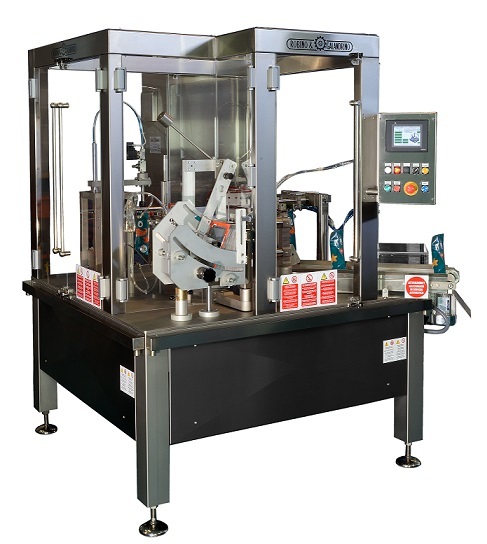 The automatic NGB packaging machine, providing ease-of-use and easy maintenance, features a carousel with eight stations. Each station is equipped with two grippers that grip the pouch along the entire process. It is ideal for filling pre-formed pouches of medium size in PET/PE, PET/EVOH/PE, PET/PP or other materials that can be sealed only inside or inside and outside. The pouches can be doypacks, stand-up pouches, flat, shaped, with gusset and spout; the pouch dimensions range from 90 to 180 mm in width and 100 to 300 mm in height. Other technical features are: power 400 V 3 ph. ; 50/60 Hz; electricity consumption 5 kW; output up to 57 pouches/min; air pressure 6 bar; air consumption per minute 200 Nl; filling volume up to 1000 ml; machine dimensions 2060x1660x2100 mm; weight 1500 kg. The machine can be equipped with different dosing systems, according to the needs; they include: multihead weigher; auger filler; cup filler, volumetric filler.